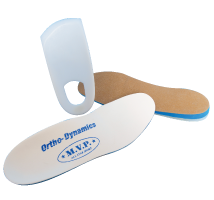 Three (3) all purpose sport orthotics that provide rigid to semi-rigid to semi-flexible control. Eight (8) sport orthotic styles to address the different biomechanics of a broad range of sport activities such as gymnastics, tennis, basketball, golf, soccer, hockey, running and track & field. One (1) all purpose high-impact sport orthotic. 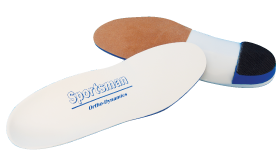 All of our sport orthotics are available in 2mm, 3mm, 4mm or 5mm, shells to address a wide range of patient weight levels and are available in met, sulcus and full length. Activity: Rigid all purpose sport orthotic that provides control and stability for a wide range of general sport activities. Components: Offered in a 4.7mm polypropylene dark blue shell. Extrinsic 55 durameter EVA rear foot post with non skid bottom cap. Shell top covered with layer of 1/16 poron for comfot. Available in met, sulcus or full length. Footwear: All full depth athletic footwear. 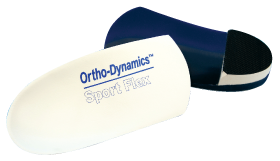 Activity: Semi-rigid all purpose sport orthotic that provides control and stability for a wide range of general sport activities. Components: Offered in 3mm or 4mm polypropylene white shell. Extrinsic 55 durameter EVA rear foot post with non skid bottom cap. Shell top covered with layer of 1/16 poron for comfort. Available in met, sulcus or full length. Activity: A heavy duty all purpose sport orthotic that provides maximum support, control and stability for heavy duty sport activities such as football. Components: Offered in 2mm, 3mm, 4mm or 5mm subortholene shell with special heel cup cut out for added comfort. Extrinsic 40 durameter rear foot post and arch filler. Shell top covered with layer of 1/8 poron for maximum comfort and full length felt protective undercover. Available in met, sulcus or full length. Footwear: All full depth athletic footwear and cleats. 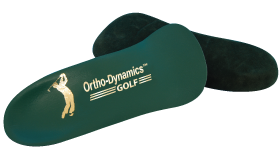 Activity: A specially designed (low bulk) sport orthotic for control and stability in a golf shoe. Designed to allow lateral to medial motion found in a golf spring. Components: Offered in 2mm, 3mm, or 4mm subortholene shell. Extrinsic 35 durameter rear foot post and arch filler. Shell top covered with layer of 1/16 poron for comfort and Spanish suede undercover. Available in met, sulcus or full length. Footwear: Regular or cleated lace shoes. 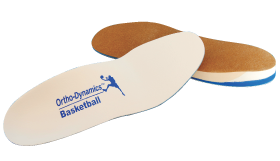 Activity: A specially designed sport orthotic for control and stability to address the rigorous motion and impact in basketball. Components: Offered in 3mm, 4mm or 5mm subortholene shell. Extrinsic 55 durameter rear foot post with split arch filler medial side open cell sponge with lateral side 35 durameter EVA for more lateral stability. Shell top covered with layer of 1/8 poron for comfort and full length felt protective undercover. Available in met, sulcus or full length. Footwear: Basketball sneakers or all full depth athletic footwear. 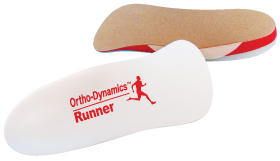 Activity: A specially designed sport orthotic for control and stability to address the biomechanics related to mid and long distance running and the excess pressure feet absorb while running, which can equal 3-4 times a person’s body weight. Components: Offered in 3mm, 4mm or 5mm subortholene shell. Extrinsic 55 durameter EVA rear foot post, open cell sponge arch filler and extrinsic 35 durameter sulcus wedge forefoot post. Shell top covered with layer of 1/8 poron for maximum shock absorption and full length felt protective undercover. Available in met, sulcus or full length. Footwear: Sneakers or running shoes. 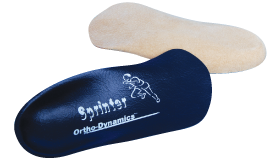 Activity: A specially designed sport orthotic to address forefoot stability in a sprinter. Components: Offered in 2mm subortholene shell. Extrinsic 35 durameter rear foot post, arch filler and extrinsic forefoot sulcus wedge post. Shell top covered with layer of 1/16 poron for comfort and suede protective undercover. Available in sulcus length. 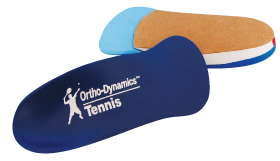 Activity: A specially designed sport orthotic to address the forward, backward and side-to-side motions related to tennis. Components: Offered in 3mm, 4mm or 5mm subortholene shell. Split posting and arch filler system with a 55 durameter lateral post and arch filler with a 35 durameter medial posting and arch filler. Shell top covered with layer of 1/8 poron for maximum shock absorption and full length felt protective undercover. Available in met, sulcus or full length. Footwear: Tennis sneakers or full depth athletic shoes. 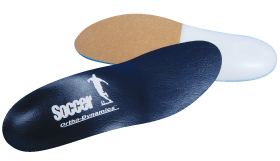 Activity: A low bulk sport orthotic that provides control and stability in the limited space of cleats. Components: Offered in 2mm, 3mm or 4mm subortholene shell. Instrinsic rear foot posting. Shell top covered with layer of 1/8 poron for comfort and felt protective undercover for extension. Available in met, sulcus or full length. Footwear: Soccer cleats or sneakers. 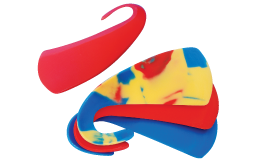 Activity: “A first of its kind” patented custom orthotic to address the need for a supportive device for athletes that compete in barefoot sports such as gymnastics and martial arts. Components: Offered in 2mm, 3mm, 4mm or 5mm multi-colored subortholene shell. Available in met length only. Footwear: Barefoot or footwear with limited space available such as ice hockey skates, track & field shoes and dance footwear.